Thirty Hamas rockets were fired on Israel and 10 were intercepted by the Iron Dome system, IDF Spokesperson reported. Two rockets fell in the Gaza Strip and 18 landed in open areas. Sirens sounded 11 times in the area over Friday night and Saturday morning. Following the sirens, medics and MDA paramedics gave medical treatment to seven victims at the site. A 53-year-old man and a 14-year-old boy were in very mild condition after being injured on the limbs while running to a bomb shelter. According to reports received during the night, the IDF attacked 80 targets in Gaza. Palestinians reported attacks by the Israeli Air Force in the south of Rafah and at Hamas' naval base west to Gaza City. An explosion was heard in Khan Yunis. In Gaza, Hamas headquarters were evacuated in anticipation of another attack by the Air Force. "The IDF has acted with force against terrorist activity and is determined to defend the residents of Israel and will continue to act in their defense," the IDF Spokesman said. The Al-Qassam Brigades, the military wing of Hamas, threatened Israel in a statement, "Al-Qassam is ready to strike at all of occupied Palestine with thousands of missiles if the campaign begins." The Al-Quds Brigades, the military wing of Islamic Jihad, threatened Israel in another statement, "We appeal to the Palestinian people and announce to them that if the Zionist enemy attacks us, we will be ready for the battle. There is no place in occupied Palestine that our missiles will not reach. Al-Az, Al-Fajr and Al-Barrak missiles, and what we have not uncovered so far. " Earlier on Friday, roughly 16,000 Palestinians protested near the Gaza security fence against IDF soldiers, the IDF spokesperson reported. Three IAF strikes were carried out during the protests targeting three Hamas positions in the northern Gaza Strip. Five Palestinians were killed by IDF sniper fire and 85 were injured, the Palestinian Ministry of Health reported. "With Nikki Haley soon to depart from her post as U.S. ambassador to the United Nations, it behooves us to review the Trump administration's remarkable policy changes vis-à-vis the UN as well as suggest further steps it should take. [T]he Trump administration has acted correctly and wisely by ceasing to dignify organizations hostile to the U.S. and its allies with U.S. membership and participation. But the work is not done. 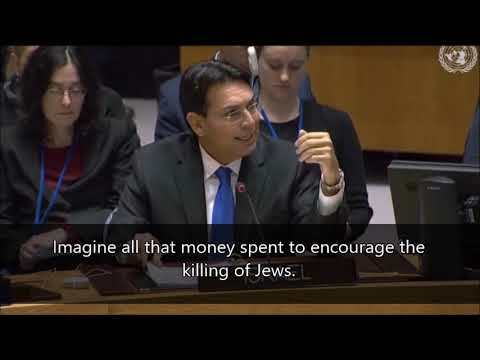 The U.S. must now close down the complex apparatus of UN bodies that have worked ceaselessly since the late 1960s to demonize Israel, ostracize it, and ultimately diplomatically eliminate it. In November 1975, the UN General Assembly voted infamously to condemn Zionism as a form of racism. In 1992, in the wake of the Cold War's conclusion, this pernicious resolution was overturned, but it continues nevertheless to inject poison into the arteries of the international system. The myriad of bodies and initiatives this resolution inspired remain operating in full force. Thus, the UN continues to fund and facilitate the activities of bodies like the Committee for the Exercise of the Inalienable Rights of the Palestinian People (CEIRPP); the Special Committee to Investigate Israeli Practices Affecting the Human Rights of the Palestinian People; and the United Nations Information System on the Question of Palestine (UNISPAL). These bodies produce streams of reports, convene innumerable conferences, and distribute copious quantities of material all aimed at popularizing the Palestinian Arab effort to delegitimize Israel. In addition to creating ceaseless activity in pursuit of this objective, they also provide endless employment for professional anti-Israel activists. In essence, the world – and America more than most via it huge UN contribution – finances an entire anti-Israel bureaucratic machine. Only the indulgence of the U.S., and far too many Western governments, has enabled the UN to continue down this destructive path for so long. Even today, they still often defer to it as though it actually represents the ideals of its founders which, of course, were abandoned or corrupted decades ago. This state of affairs should have ended long ago. The halo of the UN and its symbolic significance have impeded a sustained effort at reform and made governments reluctant to disassociate themselves from the world body. The U.S. has the power of the purse and could bring enormous pressure to bear on the UN to cease these activities..."
"The United States Commission on International Religious Freedom (USCIRF) today expressed concern about two resolutions recently adopted by a commission of the United Nations Educational, Scientific and Cultural Organization (UNESCO). Commissioner Gary Bauer cautioned, 'The idea that there's a question about the Jewish historical presence in the Holy Land and specifically at these sites is unacceptable and diminishes the religious rights of the Jewish people. UNESCO has no business pronouncing on territorial sovereignty or arbitrating territorial disputes.'" "The United Nations is not friendly ground for the United States. Last year, less than one-third of the votes taken in the U.N. General Assembly supported the U.S. position. Think that's because of the Trump administration's 'assault on multilateralism'? Think again. Since 1980, the General Assembly on average has backed the U.S. in only 35 percent of the votes taken. She's right. The deliberate decision not to weigh U.N. voting in aid allocation decisions must change. Currently, more than 400 legislative directives must be considered in aid allocation. These factors include the potential impact on the environment, labor standards, nutrition, disease, small businesses, human rights, drug trafficking, terrorism, and a host of other issues or subsets of those concerns. There are even a dozen directives involving what goes on at the United Nations - but voting patterns is not one of them. The notion that opposition to U.S. interests in the United Nations should not be a factor - not even one of 400 factors considered in allocating U.S. assistance - is ludicrous. Every session, the U.N. considers resolutions that could damage U.S. interests and our diplomats there should have as many tools at their disposal as reasonable to influence other countries, including foreign aid..."